This scrapbooking idea can be applied to various situations in your life. It can be easy and fun. It can be meaningful and showing off great contrasts. Have you recently reorganized your kitchen? How meaningful if you can show the before and after photos revealing how much work had gone into getting it neat and organized! If you recently have a new baby in your house, why not scrapbook about how it used to be before the baby’s arrival, and how’s life like right now with a baby? Another scrapbook idea. How about showing how you used to look like before your marriage and a recent photo of you after years of marriage? There’s really many instances I can imagine this idea can be used for. 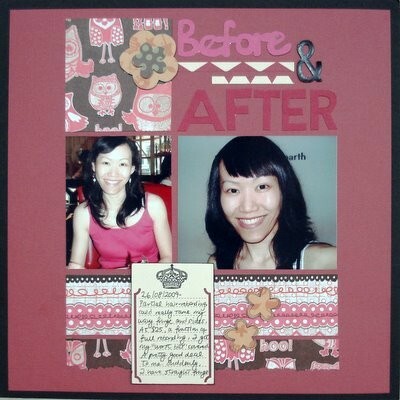 For me, I decided to use it to show how my fringe looked like before I had “partial” hair rebonding and how my fringe transformed into straight looking hair after being rebonded. I’ve long accepted and come to appreciate my natural wavy hair. But… it can be quite tricky as my fringe and sides can get especially wavy and hard to tame. Having my hair rebonded specifically on these areas, the rest of my hair is much easier to handle now. Think for awhile and see what before and after pictures you can come up for this idea! Have fun and enjoy! Supplies used: Cardstocks – Bazzill Basics and The Paper Company; Patterned papers – Sassafrass “Serendipity – Owl Pals”, Love Elsie “Jack + Abby Stripe Dot”; Journal paper – Teresa Collins “Journal-It”; Flower template – Craft Flowers Autocollants; Alphabet sticker – American Crafts “Thickers – Vinyl”; Black pens – Zig Memory System “Millennium”. Layout inspired by: Vivian Masket “A New Friend”.